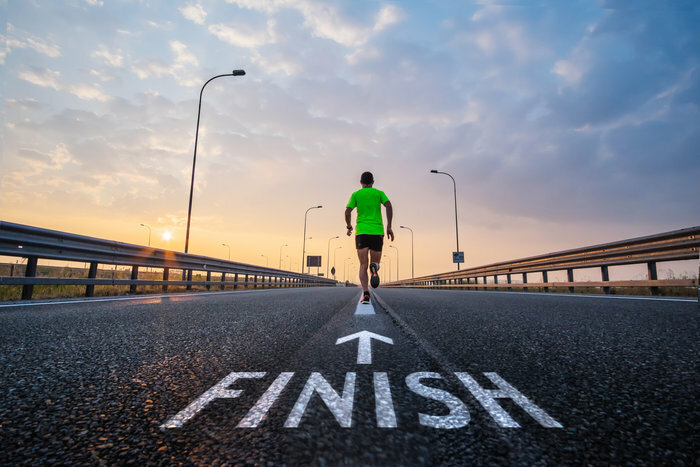 One of the key things that I try to instil into the runners that I coach, is to “finish strong.” They are two simple words that may not seem like much when written into a training plan, but they make an enormous difference to how you run. 1. Finishing your run by pushing home, feeling strong and overtaking people in the last couple of kilometres. 2. Finishing by gradually slowing, being overtaken, feeling tired and floundering, breathlessly to the finish line. Which would you rather experience? I ask my runners to “finish strong” every so often in their training because it relies on them pacing themselves in the early part of the run or race. Whether you do that by feel, heart rate or pace doesn’t really matter, but the principle is to keep all of those under control and not empty the tank too early. Control the early stages of the run, in order to be able to push home at the end. You would be shocked by the number of runners that I talk to who swear that they “just can’t do it,” as if to say that they are not in control of their legs, brain or heart. But there in lies the point. They genuinely don’t feel like they are in control or that there is actually a choice in the matter. It actually requires discipline, restraint, calmness under pressure, patience, trust in yourself and self control to pace yourself, which is probably why not many people do it! This is the sort of thing that fascinates and frustrates me in equal measure as a coach, because most of the time, it’s not an ability thing, it’s an attitude thing. It’s not about average pace, stride length, heel striking or vertical ground oscillation, which so many people read so much into. It’s predominantly about attitude and if we can get the attitude right, the rest will come. One of my favourite sessions to test out this attitude with my runners is to ask them to ‘negative split’ their 5km parkrun on a Saturday morning. Parkrun is now a global running phenomenon which is meant to be a run not a race. You can run, walk, push a pram, take your dog or crawl it. Whatever you choose. That’s fine in theory but just ask a collection of parkrunners how they did on their Saturday morning parkrun and you will see that they take it just as seriously as professional runners take their Olympic Qualifying Race. I’ll save the why’s behind that for another time, but it’s safe to say that people want to go faster each week and there is a certain amount of pride and ego that comes out to play each Saturday morning run. Put simply, with this type of session, I want my runners to go faster in the second half of their parkrun than the first half, finishing the run fast and strong. What is interesting is not the finish time, the average pace, or even whether they ran a PB, it is whether they actually can do the session that I have asked them to do. At parkrun, similar to in a big race, when ego, competition and excitement creep in, people go out too hard at the beginning, leaving them no energy to speed up when they are supposed to be finishing strong at the end. In this case, it’s ego and / or the runner’ pre-conceived idea of what parkrun is (a race, not a run) that fascinates me. I don’t want people to think that I am immune to this phenomenon. Certainly not! I have written about getting over my own ego before and as a male in his mid-late 30’s, that is not an easy thing to do! I distinctly remember Melbourne Marathon in 2017 as an example where I didn’t take my own advice. I screwed up my pacing early on, knew I was in trouble, promptly carried on running too fast and paid for it later. Whether it was ego, pride, stupidity, forgetfulness or a giant brain fart, all I know is that my last 12km was a struggle of epic proportions. My momentum, cadence, pace and probably everything else dropped off at that point, never to be seen again! Not pleasant, but very much a situation of my own making. The point is that there are different ways to go about our running and we all actually have a choice in the matter. We can choose to control the first part of your run or not. We can choose to go out too hard, or not. We can choose to keep repeating the same mistakes, or not. I hope that more of us choose to experiment with controlling more elements of our running and being less influenced by our ego. I suspect the result will be stronger finishes for us all. GETTING BACK INTO YOUR RUNNING? 5 Tips to Keep You on Track. 4 REASONS YOU”LL CRUSH YOUR PB BY RUNNING SLOW. Running Shoe Weight – What Really Matters for a Faster Triathlon?